People who experience hair loss can often pin it down to a genetic condition – male or female pattern baldness – but sometimes thinning hair is caused by a reaction to a completely unrelated medical complaint. This appears to have been the case for French tennis star Marion Bartoli, who has recently revealed that a mystery illness contracted in India caused her hair to start falling out. The Wimbledon 2013 winner, who retired from the limelight not long after her landmark victory, said in an interview with French sports newspaper L’Equipe that an ex boyfriend was to blame for a number of personal problems she endured from around May 2014, including weight loss. This coincided with an unnamed and apparently very serious virus entering her bloodstream which resulted in her losing even more weight – to the point that she was stopped from playing in a Wimbledon invitational event in 2016 amid health concerns. During this period, the player says she would see her hair fall out when she brushed it, and also revealed that she almost lost her teeth. What seems likely is that in her weakened state Bartoli had become susceptible to quite a common shedding condition known as telogen effluvium. This hair loss condition has a number of triggers and is a biological response to some kind of stress that has been placed on the body. This can be emotional stress as experienced by somebody who may be depressed or overworked, or physical stress of the type that might arise when somebody adopts a punishing gym regime, starts new medication or contracts an illness of some kind – even if it is undiagnosed. In most cases, hair lost to telogen effluvium will grow back when the underlying cause ceases to exist. When this does not happen and hair thinning continues longer than a year, it is normally reclassified as chronic telogen effluvium, also known as diffuse hair loss. At Belgravia, treatment for telogen effluvium and for diffuse hair loss can be effective, and makes use of topically-applied high strength minoxidil from the formulations available at the clinic’s in-house pharmacies. 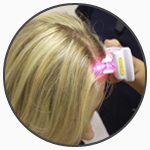 This can be used in conjunction with complementary hair growth boosters, including FDA-cleared low level laser therapy devices such as the HairMax LaserComb, which are combed through the hair in order to stimulate follicles. Another popular addition to Belgravia’s hair loss treatment courses is the one-a-day, premium food supplement for healthy hair growth, Hair Vitalics, which has been designed by Belgravia’s experts to provide highly-targeted support from key vitamins, minerals, amino acids and botanical extracts. These exclusive supplements, which are free from sugar, salt, lactose and gluten, and are suitable for vegetarians, have been formulated in for Men and for Women options, for maximum benefit. The good news for Bartoli is that she appears to be on the mend. On a TV interview with This Morning her hair was looking vibrant again, and she has also revealed that she hopes to return to competitive tennis in March if she feels fit enough.